While harvesting lavender, the heat of july days contributing factor, the air around was full of the characteristic flowery-canforaceous odour of this type of lavender: clean, simple, familiar. The principal chemical molecules that are in the lavandin odour are linalool, linalyl acetate, camphor, borneol, cineol, terpineol. 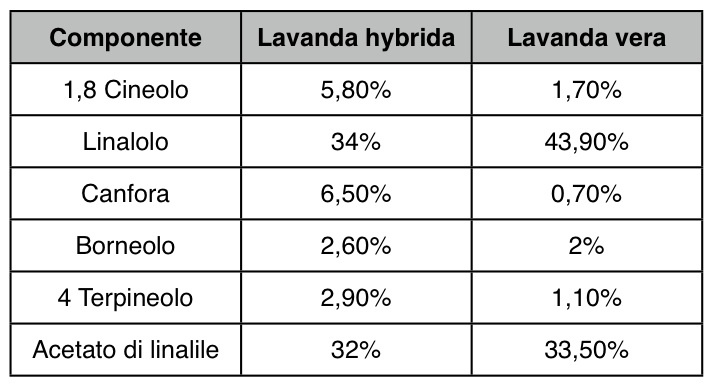 The principal difference between lavanda vera (Angustifolia) and the lavandin (lavanda Hybrida) is represented by the relative concentrations of the chemical components as shown in the following table. 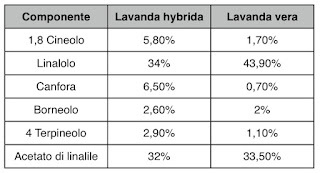 Cineole and camphor are less present in lavanda vera; in fact its olfactive profile is a bit more flowery respect to lavandin; it is although seen a higher linalool content, a terpenic alcohol that is present in several essential oil compositions and here, in lavanda vera, contribute to its flowery aspect. 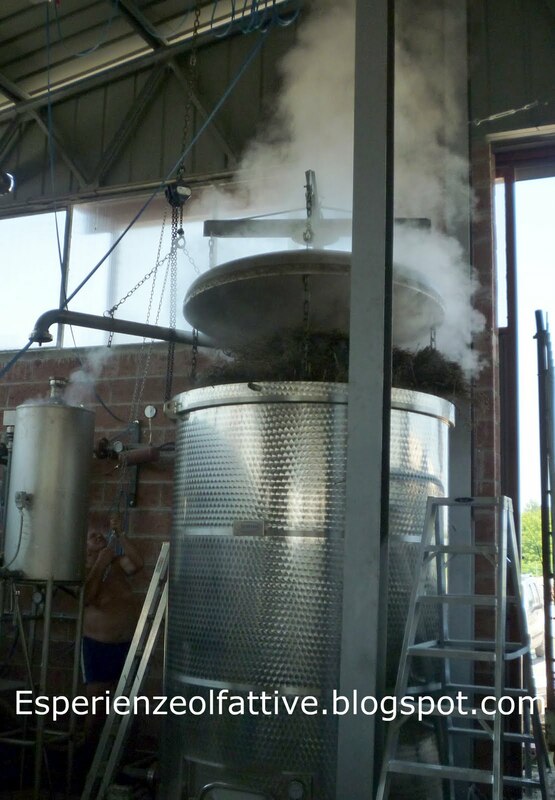 As soon as harvested, lavender is sent to distillation; from harvesting to distillation lasts no more than 1-2 hours. 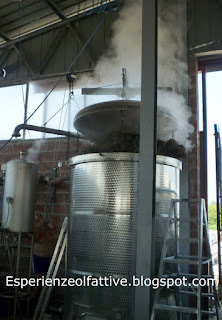 The big Boiler is loaded to proceed at the operation that, as simple,always show its magical side during its execution. From the bottom of the Boiler, water steam is injected to slowly heat all the boiler volume until it is reached 100°C (212°F) necessary for the vegetal membrane rupture that hold the precious scented liquid. 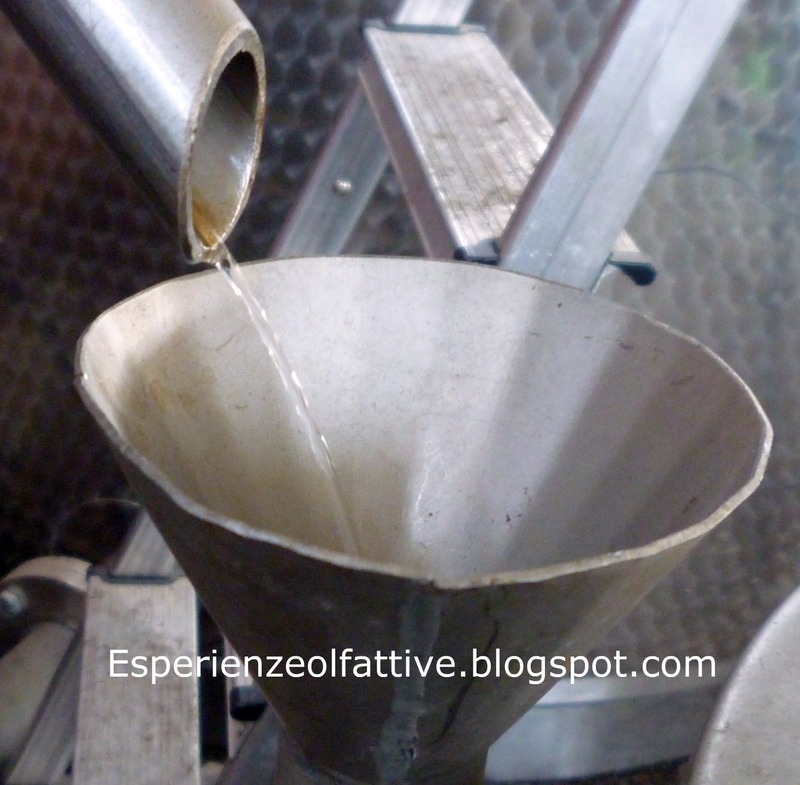 After 10 minutes the steam, full of essential oil, start to come out from the top of the boiler and through a pipe called “swan neck” reach the cold part of the distillation unit, the condenser. 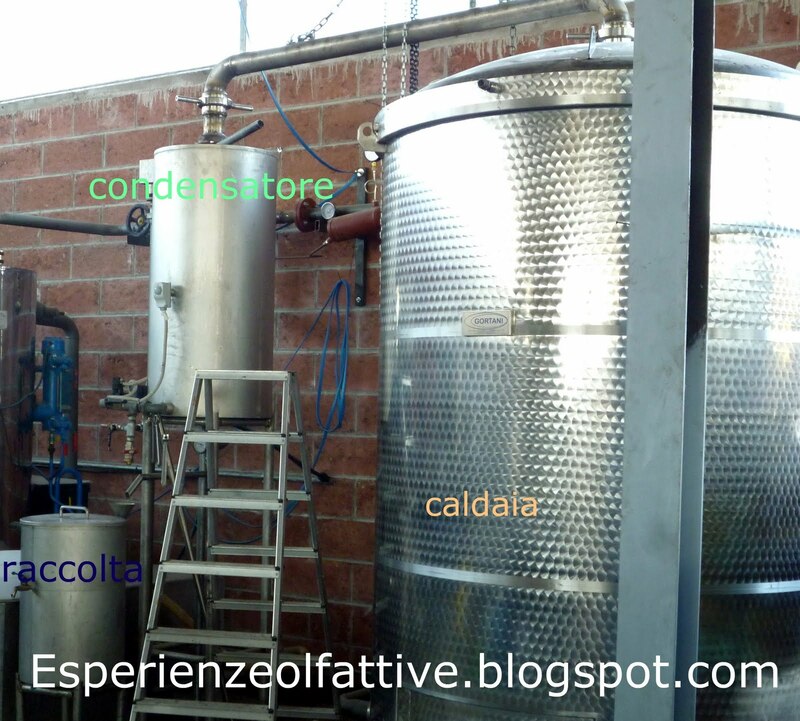 The distillation proceed til visually the arrive of essential oil on the aqueous layer start to be less; the steam generation is then stopped and it is waited that the temperature inside the boiler is low enough to operate the discharge. The discharged material is carried outside the plant and let dry so to be used it as recycled organic material. 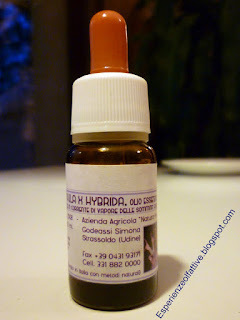 The essential oil separated from the water is bottled and matured for some weeks, shielded from light and in fresh conditions just before the bottling of the 10 ml droppers. 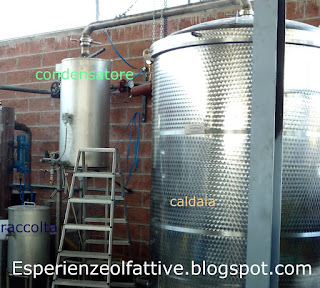 The aromatic water is stored in large bottles and in fresh conditions too. they are then bottled in 1 liter bottles for selling. Being part and watching the transformations that leads at the “capture” of the aromatic soul of a plant is an experience that, although simple, is always unique. 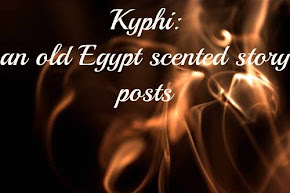 For a curious about odours like me, a joy being immersed in the light and clean lavender scented air that was hugging all of us protectively.